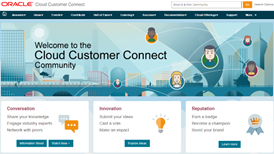 The Oracle PaaS and IaaS customer forums have moved to Oracle Cloud Customer Connect and now include over 20 discussion forums covering a wide range of Oracle platform and infrastructure services. We encourage you to be active in these forums as a way to network with the Oracle customer community and build your reputation as an Oracle Cloud expert. Please join today.